Ludwig von Beethoven (Germany 1770-1827) was one of the most influential composers in history. His musical ideas helped the world transition from the Classical style of music into the exciting harmonies and rhythms of the Romantic Age. 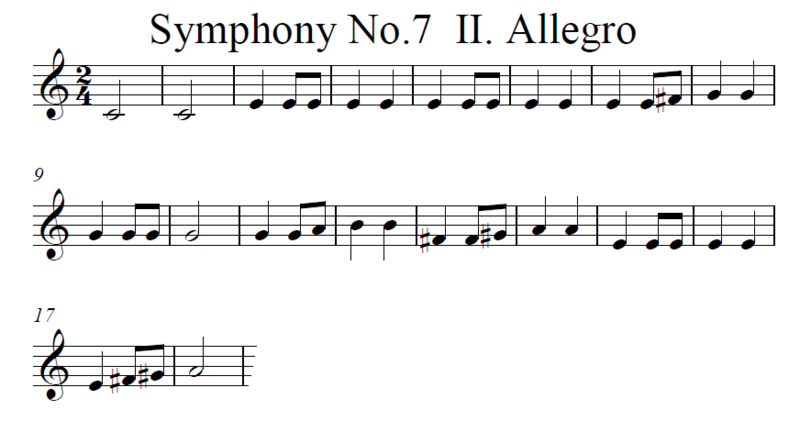 This repeating rhythm in the 7th Symphony Allegretto can be easily heard and described by students. 1. After listening to the piece, ask students to clap/sing the rhythm they heard over and over in the piece. ​2. Have the kids play the rhythm on Orff instruments, keyboards or band instruments choosing notes from the pentatonic scale to create new melodies with this rhythm. ​3. Have the kids learn to play this melody on classroom instruments, notation is below.